Welcome back to another week of The Sunday Showcase where we showcase YOU! and your child-centered ideas and activities. I hope you all had a blessed 4th of July! We did! And since it's my favorite holiday, I'm extending the celebration a bit longer by featuring some fabulous 4th of July posts from last week's showcase! The Journal of a Laura Ingalls Wannabe shared their painting with textured balls post and I LOVE that they turned out looking like fireworks! Crystal from Growing a Jeweled Rose is a pro at making bath time fun and her 4th of July bath did not disappoint! I also love the toddler friendly fireworks they made on the side of the tub! Her blog is FULL of bath time fun! Sugarsnips shared this simple art project created by exploring symmetry! Love the fireworks! 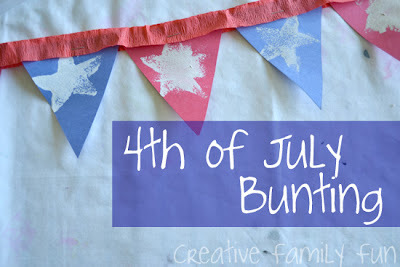 Isn't this patriotic bunting shared by Creative Family Fun just the cutest thing ever? I love that you can do this for many different holidays and celebrations! And I love, love, love these Sparkling Fireworks from One Perfect Day! If you haven't tried straw painting, give it a whirl - it is awesome! Our post for Week 3: Character Development of the MeMeTales Readathon. 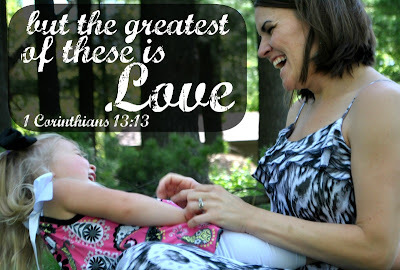 I wrote about loving and teaching our children to love as God loves us to instill positive character traits.